More than half-way through our fall Community Tree Planting season, Casey Trees is having a great time adding young trees across D.C. The weather has been gorgeous lately, every event has been a success and we've had the opportunity to plant at eight schools across the District! Oct. 19: H.D. Cooke Elementary School. 23 third-grade students got their hands dirty with Casey Trees when they helped plant six trees all around their school grounds. Oct. 19: Chamberlain Public Charter School. 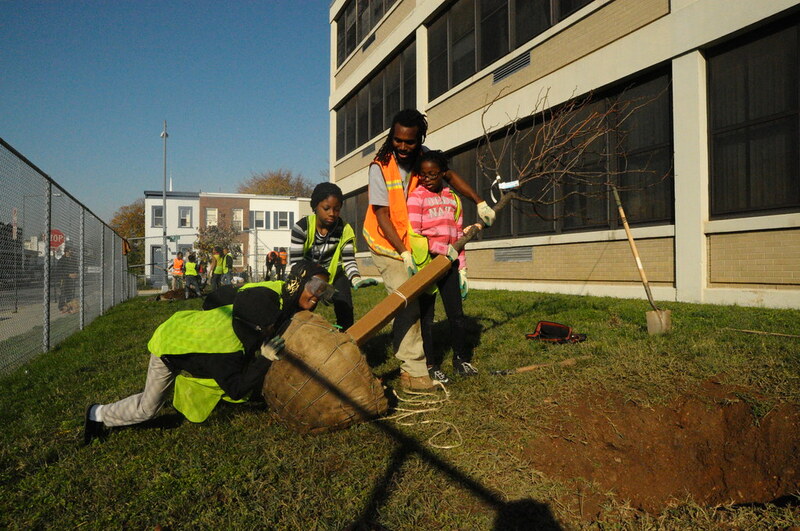 Just a couple hours later, 11 students from Chamberlain PCS helped Casey Trees put four trees in the ground. A class of Pre-K students learning about trees in their class came out to watch the event. Oct. 20: British School of Washington. 23 students ranging from age 6 to 16 planted six trees. We interviewed teacher and project organizer Mr. Horton as part of a feature story in our September E-Newsletter! Oct. 26: Woodridge Elementary Friendship Public Charter School. 23 fourth-graders helped us plant 5 trees, including 3 redbuds. Anticipating the event, the excited students had made posters announcing the planting and put them up all over the school. Students from the British School of Washington prep the ground for new trees. See more photos from the event! Oct. 26: John Burroughs Education Campus. Right after the Woodridge planting, we planted two sweetgums, two tulip poplars and one yellowwood with the help of 11 students. The John Burroughs students ranged from first to sixth grade. Nov. 2: Blow Pierce Junior Academy Friendship Public Charter School. Mrs. Leavengood-Boxer's fourth grade class joined Casey Trees in planting six trees. The event was especially enjoyable for Casey Trees staff member Jabbari Brew who attended Blow Pierce! Jabbari Brew helps fourth-graders from Blow Pierce roll a tree into its hole. Check out more photos from this planting! Nov. 2: Capitol Hill Montessori School. The Casey Trees planting crew headed from one school planting to the next and helped plant 6 trees at Capitol Hill Montessori. Nov. 3: Collegiate Academy Friendship Public Charter School. 10 high school seniors helped us plant six trees. Following a pattern of reminiscence, Collegiate Academy is Jabbari Brew's high school Alma Mater. Casey Trees school plantings are a little different from the rest of our CTP events. Schools can request fewer than ten trees - the minimum for CTP sites. Additionally, students are the only volunteers so they get to experience every step of the planting process. We go back to the school about a week after we plant to go over tree-watering methods with the students. From start to finish and as the trees grow, students learn first-hand how important trees are for our environment.